For The ACID Fan On The Go! By infusing essential oils, herbs, and botanicals with the finest longfiller Nicaraguan Tobaccos, Drew Estate has created a kaleidoscope of tastes never before imagined in a cigar. 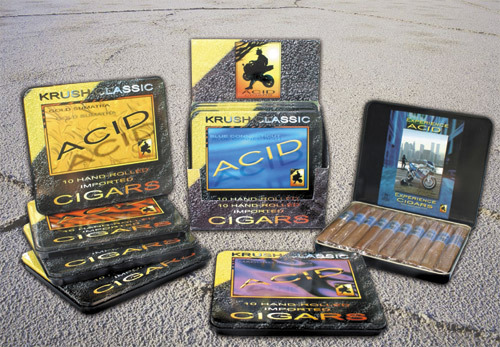 Now the Experience of smoking an ACID Cigar is captured in ACID KRUSH CLASSIC. Packaged in a collectible tin, these handcrafted petite cigars have all of the distinctive tastes that you have grown to love, in the four unmistakable blends of ACID: Red and Purple Botanical as well as Blue and Gold Herbal. Don't let your predjudice of falvoured cigars keep you away from these gems. They are more accurately described as spiced. The added flavours are rich interiguing yet do not over power the tobacco flavour.